The night was never meant as an opportunity for Prince to show how dazzling and virtuosic he was on the guitar. 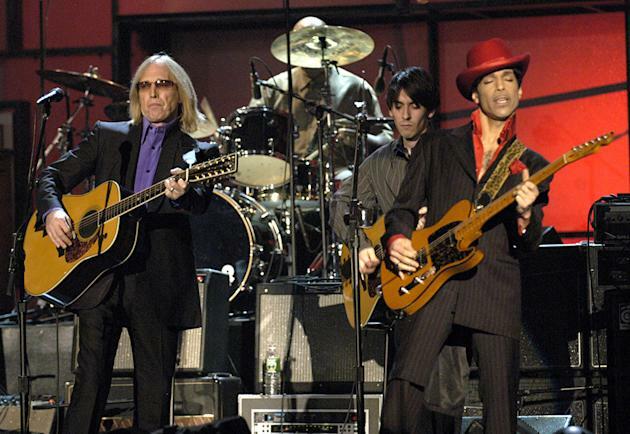 For a star-studded performance of the Beatles’ “While My Guitar Gently Weeps” at the 2004 Rock and Roll Hall of Fame induction ceremony, Prince was scheduled to play one of several solo spots to honor George Harrison. The Beatles guitarist was being posthumously celebrated at the event, with one Harrison’s most emotional and melodic songs. And Tom Petty and Jeff Lynne (who played with him in the Traveling Wilburys), Steve Winwood (who took part in the 1979 sessions for George Harrison), and his son, Dhani Harrison, were there to play their respects gently. Prince blew them all away. In the days since Prince’s shocking April 21 death, musicians, celebrities, and fans have turned to that Hall of Fame solo as proof that Prince was a guitar hero as well as a brilliant songwriter, singer, and performer. And they’ve voiced their opinions on Twitter.